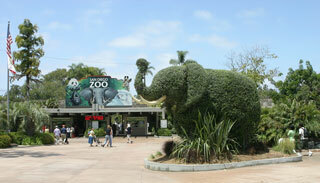 The San Diego Zoo is a zoo housing over 3,700 animals of more than 650 species and subspecies. The San Diego Zoo was a pioneer in the concept of open-air, cageless exhibits that re-create natural animal habitats. It is one of the few zoos in the world that houses and successfully breeds the giant panda. In 2013, the zoo added a new Koalafornia Adventure exhibit, providing an updated Australian animal experience. 2017 will see the opening of Africa Rocks. This article uses material from the Wikipedia article "San Diego Zoo", which is released under the Creative Commons Attribution-Share-Alike 3.0 License.